St Teresa’s National school was opened in 1911. There were 73 pupils and four teachers (2 men and 2 women). St Teresa’s church and school at that time belonged to the parish of Derriaghy and it remained a small country school until the first housing estate Andersontown Park was built in 1935. 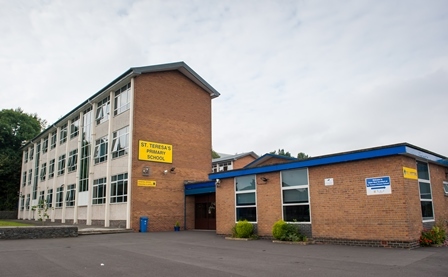 In 1939 St Teresa’s Public Elementary school was opened and during the war years as people moved to avoid the Blitz, west Belfast gradually expanded and the number of children attending St Teresa’s school increased also. In 1943 more houses were built in Bernagh Drive. 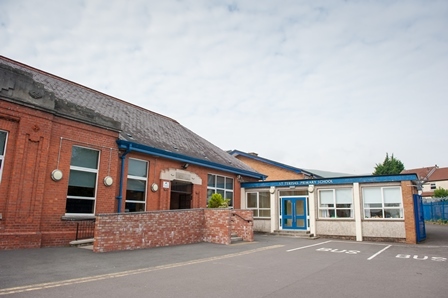 In 1955 a second temporary school was opened at Casement Park to facilitate the growing number of families that were moving to the Andersontown area and to support the new Church of St Agnes. In 1959 the Parish of Derriaghy was subdivided and the new parish of St Teresa was created. By the early 1960s St Teresa’s boy and girls school provided education for over one thousand children due to the rapid housing development in the area. As our city has grown and people have moved on or become settled this number has decreased gradually. By 1995 there was an insufficient number to sustain separate Boys and Girls schools and both amalgamated to become a co-educational maintained school. In September 2009 a Speech, Language and Communication Centre opened as part of St Teresa’s school. St Teresa’s Primary school has been successfully serving the community for one hundred years. Our Centenary celebrations took place in the school on Wednesday 9th November 2011. St Teresa’s Primary School has a tradition of high academic standing and a dedicated pastoral care of its pupils.